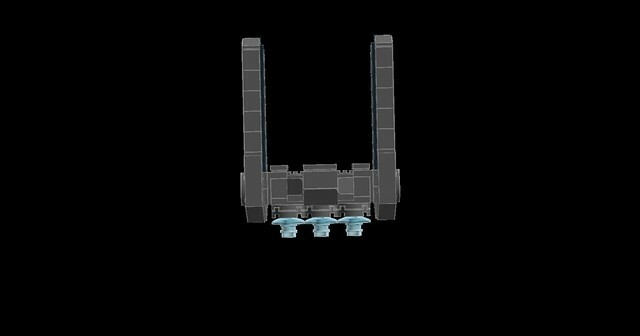 I really, really like the design of the Liberator Class Frigate, and decided to upgrade it to a Carrier Class by adding a launch catapult. The all black is kind of boring to look at, so I'll go back and add so highlights when I get a chance. Last edited by Grass4hopper on Sat Jun 04, 2016 1:09 am, edited 1 time in total. Grass4hopper wrote: I really, really like the design of the Liberator Class Frigate, and decided to upgrade it to a Carrier Class by adding a launch catapult. The all black is kind of boring to look at, so I'll go back and add so highlights when I get a chance. FWIW, it looks pretty good in black kudos on photographing it well. I always think black looks better in person than in photos... until I see someone else's photos. Really enjoying the shaping here. Just asymmetric enough to look intentional, but not so much as to throw off the profile. Nicely done. I thought the launch catapult looked a little thin, so I beefed it up. I may go back to the thin version, haven't decided yet. I like it! I prefer the skinnier catapualt because to me it looks more like a modification of the basic vessel (itself a modidfied freighter) and that fits with the "feel" of the Liberator Class better than the more purpose-built apperance the larger catapault gives (although I think it looks good too). I'm right there with you on the Liberator, Grass4hopper. It's my favourite of the core ships. And these modifications look really great. I think you've executed the chunkier catapult really well, and if I were seeing the ship class for the very first time that's the one I'd pick. But I'm kind of with Hackjob -- the skinnier catapult looks more like a mod to the original ship, rather than a redesign, and that's cool given the ship's background. Nice job on this one, Grasshopper. As for the catapult, have you tried splitting the difference between the two designs? 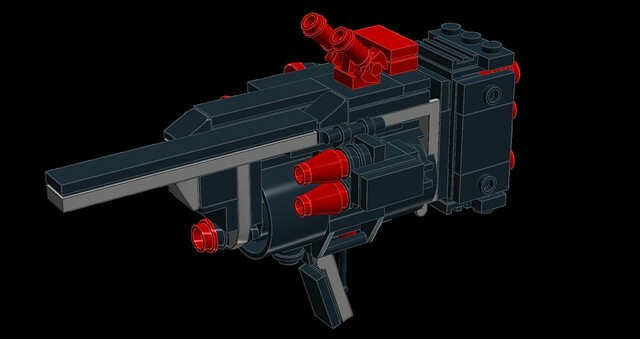 Keep the wedge piece but remove one or both of the added bricks; this would allow the catapult jut out from the ship but still look more supported maybe without looking completely purpose built (if that's what you're going for). spacemonkey wrote: Nice job on this one, Grasshopper. As for the catapult, have you tried splitting the difference between the two designs? 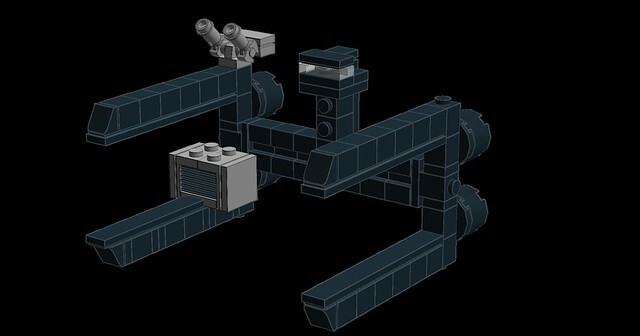 Keep the wedge piece but remove one or both of the added bricks; this would allow the catapult jut out from the ship but still look more supported maybe without looking completely purpose built (if that's what you're going for). 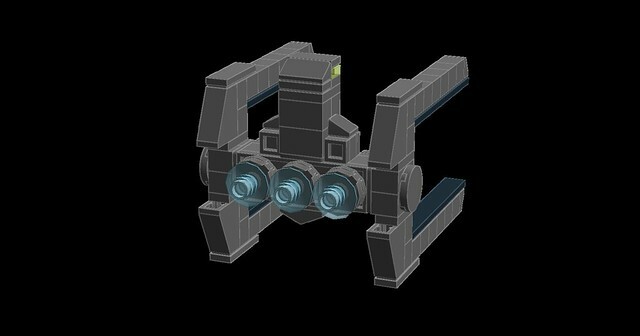 I'm working on planning the rest of my fleet, but am having trouble finding designs that go well with the Liberator. I know that ships can be captured from other factions so I could use any design from the rulebook, BUT I want this fleet to look like converted ships as opposed to dedicated military vessel. 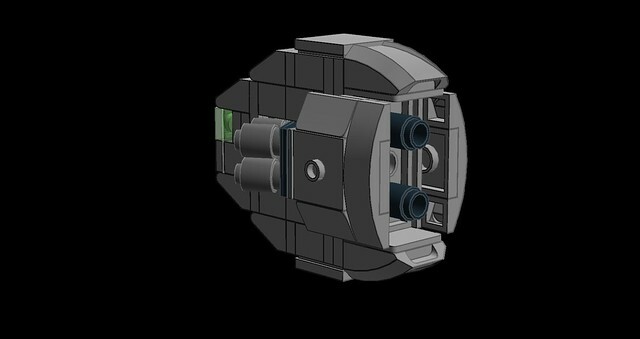 Here's a Torpedo Frigate I'm working on. I copied CmdrRook's back end from his PAX East Demo fleet. I feel like the rest of the design needs work C&C appreciated. The symmetry and rounded look in the nautilus is really charming, like a tiny swimming beetle, and I really like the effect you got out of sweeping forward the engine cowling to cover more of the fuselage of the ship. As-is, I can see it being a tug-boat of sorts. A cargo-hauler like the Liberator, but meant to drag payloads that attach to the outside of the flat sides of the ship rather than fill an internal hold. Perhaps try attaching something that looks like it belongs on a completely different class of ship to exaggerate this look, like mounting a Katyusha to a dump-truck might? The 2x1 bar tiles are excellent detail pieces, a good way to bring outside space into the ship's form. I always imagined them as docking bays or hangars for smaller craft when I used them. Repeated so many times, they lose uniqueness and purpose, and would be suited just as well by regular sloping bricks. I would try sticking 2x1 plates into their gaps to see if you like the look that builds, and if not, consider another approach towards narrowing the bow of the ship. PS: if you turn the nautilus sideways, it looks like a YT-1300, aka; the millennium falcon. Edit: you also reminded me that I needed to upload some pictures I took from PAX, thanks! I like it, Grass4hopper. It looks nimble, like the sort of thing that would dive in between the ships of an enemy fleet. 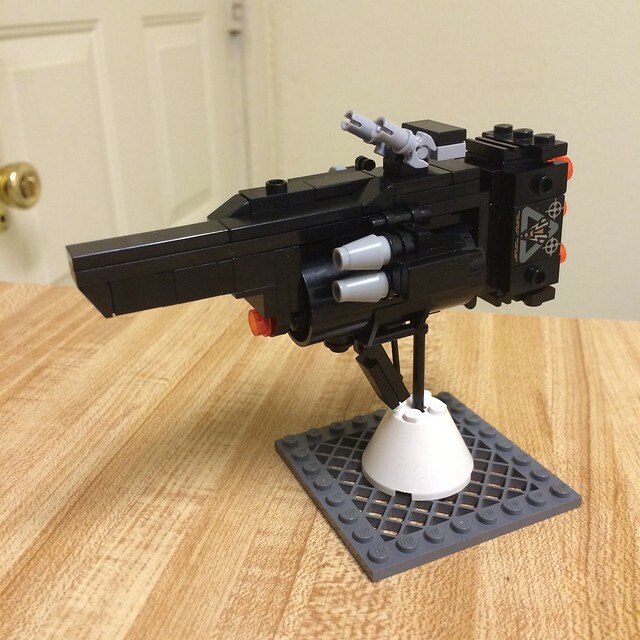 In line with CmdrRook's suggestion about attaching something that looks like it came from a completely different fleet, I feel like a bit of asymmetry adds to the cobbled-together look. 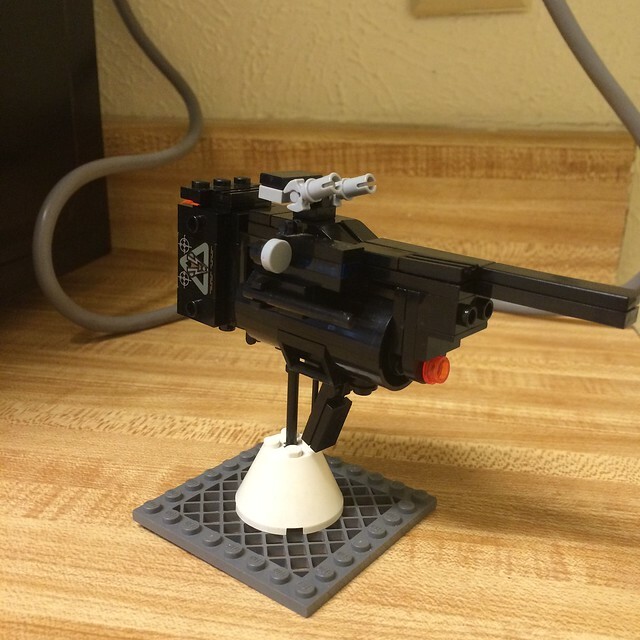 Certainly the Liberator is asymmetrical. Perhaps the torpedo bay only one side of the ship, and something else entirely on the other? A sensor pod? Grass4hopper wrote: You mean like this? Yep; you might throw a plate under the slope for a touch more length but overall I think it creates nice balance between the two versions. A new design I'm working on, this is just a rough build to get the basic shape. It's a freighter where cargo containers are interlocked and held in place by the four arms. 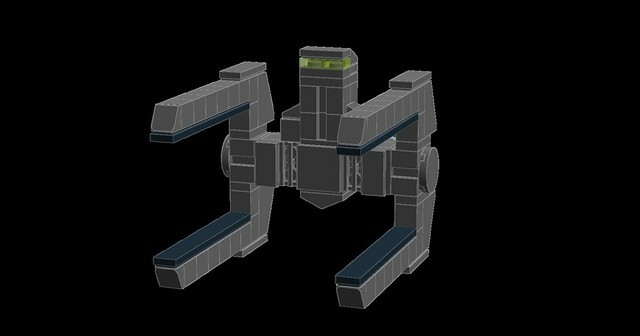 The four arms can be converted to hold weapons, scanners or catapults. 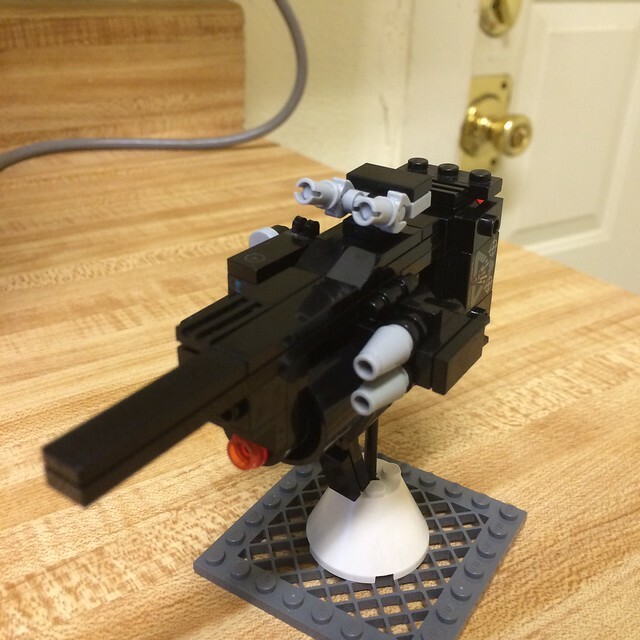 It' just small enough to be a Frigate. Those are all really nice, Grass4hopper! Skeleton Mkll. Still small enough to be a Frigate. I feel like it can still be improved, but I don't know how. I'm trying to build from what I learn from Soren's builds. 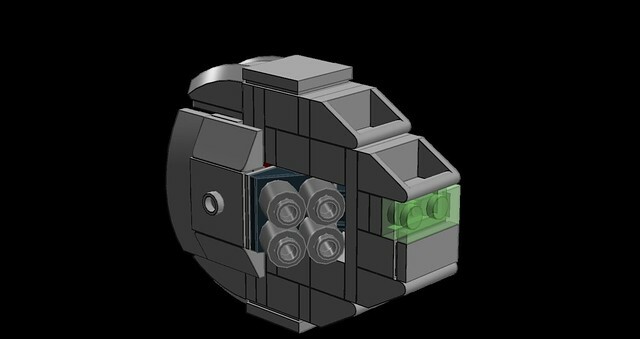 LayRong wrote: if you turn the nautilus sideways, it looks like a YT-1300, aka; the millennium falcon. you also reminded me that I needed to upload some pictures I took from PAX, thanks!